This article originally appeared in IB Global News Vol. 1, Issue 5, which provides an array of news and information about IB programmes, professional development and research. 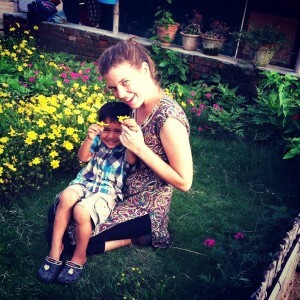 Maggie Doyne is 26 years old and has 40 children. They all live together in the Kopila Valley Children’s Home, the orphanage that Doyne founded in Surkhet, Nepal. The children, whose ages run the gamut, attend the school that Doyne also founded. The story of the orphanage and school and the organization behind them—the BlinkNow Foundation—began when Doyne took a gap year after graduating from West Morris Mendham High School, New Jersey, US, in the Diploma Programme. She traveled through several countries. 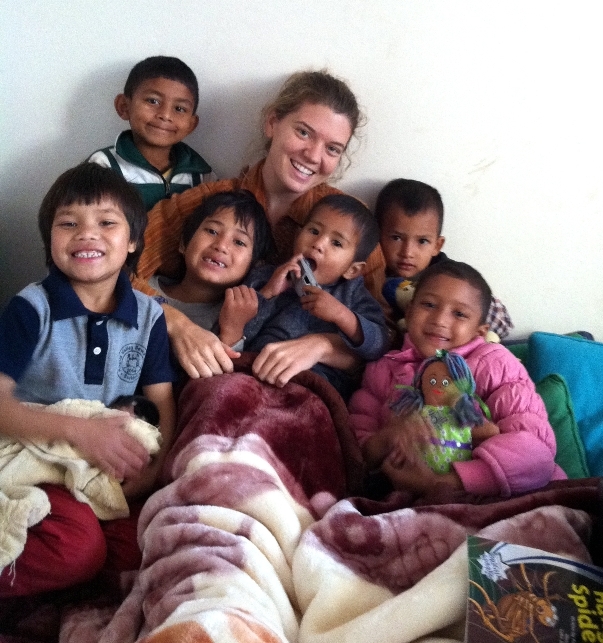 In Nepal, she says on the organization’s website, “I began to meet hundreds of orphan children. I fell in love with their bright eyes and beautiful smiles,” and was determined to help as many of them as she could. A book you read in the ninth grade that you have cited as inspiring you is Free the Children: A Young Man Fights Against Child Labor and Proves that Children Can Change the World by Craig Kielburger. Which class did you read that for? What about that book has stayed with you? I read Craig Kielburger’s book for my journalism class and wrote an article about Craig’s mission and child labor for my school’s newspaper. I loved Craig’s book because it was proof that, no matter what your age, you can change the world and make an impact. Craig’s story stuck with me and was my first glimpse at how children struggle in other parts of the world. During your gap-year travels that ended in Nepal, you visited several other countries. What about Nepal was so compelling? My travels throughout remote Nepal and the Himalayas gave me real insight into the aftermath of a civil war. It was shocking to see how significantly the war and extreme poverty affected women and children. In 2005, just as I was graduating high school in Mendham, NJ, the U.N. estimated that there were a million orphan children in Nepal, a country the size of Louisiana. I saw a lot of poverty throughout my travels. I also saw a lot of beauty and was inspired by how hopeful everyone was that things would get better. Then I met the children, learned their stories and knew it was too late to turn back. Once the home existed, how did you cope at the beginning with all the demands of running a group home in Nepal, where—in your early 20s–you may have had gaps of knowledge or experience? Were you able to leverage your mission with local resources? Absolutely. It was all about assembling a good, solid local team who shared the same goals, ethos and values. I formed a local Nepali board and committee of village elders and leaders. I listened to everyone’s ideas and followed through with making sure they were put into action. I was only 19 and especially not knowing the language in the beginning… oh, my gosh, that was so incredibly difficult. But I think it all drove me to learn faster. I learned Nepali. I went home for a few months to fundraise and checked out every single book I could find in the library on poverty alleviation and failed and successful projects with regards to foreign aid. When I didn’t have answers to questions, I searched far and wide to find people who did. I’ve always had amazing mentors and teachers. My IB coordinator and Theory of Knowledge teacher from high school, Kathy Kremins, joined my US board of directors and helped me tremendously during those early years. Building an orphanage and taking care of 40 children—even with all the support that you have received—is hugely demanding. Why did you also feel impelled to build and run a school? The process of starting the school was very organic. While raising my children, I realized that I wasn’t content with the standard of education they were receiving. On top of that, I couldn’t take every single child into the custody of our home, and I knew that what many of the kids needed was a quality education and a safe place to come each day. In 2008, I won the Do Something award to build a school for my children. We started with 60 kids and in just four years increased to 340 students. At first, it was all about providing the children with their most basic needs, food to eat, basic health care from our clinic, clothes to wear. Four years later, they are putting on plays, poetry slamming, running a chess club, and have emerged as one of the top-performing schools in the region and Nepal. You have said that education is the only way to a brighter future. How did your IB education help prepare you for the work you are doing now? My IB education made me a curious learner. It taught me to ask questions and engage in debate, and that my opinions and ideas matter. The program at my high school was rigorous. It taught me hard work and how to stretch myself academically and philosophically and instilled leadership skills in me. I especially loved the service learning element. There’s not a day that goes by that I’m not thankful for my education and my teachers. Given budgetary and practical limitations at the Kopila Valley School, do you include aspects of an IB education? In most classrooms in the developing world, the teachers still carry a stick and beat the kids when they don’t know the answer. It was hard to try to change the system. I hired young teachers who were willing to learn and do things differently, teach with creativity and have our kids think outside the box. We also implemented our own service program. At the end of the day, you teach the way you were taught and you create things based on your early childhood experiences. As the founder and director of this school, I make sure that IB values are woven into the culture, community and curriculum at Kopila Valley. I hope to do more with IB programming in the years to come and hopefully have access to more curriculum and materials. How do you plan to expand or replicate the Kopila Valley School model? We’re currently working on building our first high school, which is crazy and hard to believe, especially since I feel like I just finished high school myself. We also offer trainings and run Kopila Valley as an open-source model–anyone can come from around the world to learn how we do things here. The IB is all about lifelong learning. Do you feel that you continue to learn? I always remind my children I am learning every single day. There’s not a day that goes by that I’m not working and trying to improve things, to make our organization better and more efficient. My education has never stopped.